'Attachment' is a term describing the nature of the emotional relationship shared initially between a child and their primary caregiver(s) and later between adults within important adult relationships. In childhood, healthy or 'secure' attachments are characteristic of children whose physical and emotional needs are adequately met by their primary caregivers; they develop a general sense of safety, security, and feel loved. Through these early interactions, they learn that the world is a relatively safe and predictable place and that they can rely on people who care about them for support and reassurance during times of stress (Cassidy & Shaver, 2008). Secure attachments also provide a context for regulating emotion. For example, in a secure attachment relationship, an attuned and sensitive caregiver will comfort their distressed, upset, or crying child by providing familiar eye contact, physical touch (i.e. hugging the child or rubbing their back), and a concerned or soothing tone of voice, and/or reassuring words that communicate empathy and understanding of the child's internal state. Neurobiological research suggests that when a parent engages in the above responses, the child's nervous system responds in turn, by activating systems within the body that work to "soothe" a state of heightened emotional arousal or distress (Schore, 2003). Behaviourally, we can observe that the child feels reassured and comforted. We know that activated states will eventually become traits, which means that through these repeated interactions, the child's body is "learning" to more readily activate its own adaptive mechanisms in response to future states of emotional distress where the parent may not be present (Siegel, 1999). 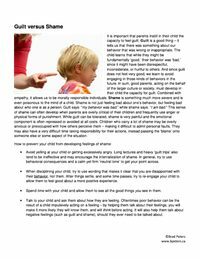 In other words, these highly attuned and responsive forms of emotional communication between parent and child help the child to regulate their emotional states, not only in their immediate environment, but also in the future, by building the internal conditions that permit the child to tolerate higher degrees of distress and to self soothe as an adaptive coping mechanism. To summarize, a healthy early attachment relationship allows a child to see the world as a relatively safe place. They instinctively trust that they can rely on others when they are in need of help or support. They are able to feel emotionally vulnerable with people who are close to them and will naturally feel some mild discomfort, anxiety, or distress if they are separated from their attachment figure(s). Since they have learned to tolerate high levels of both positive and negative emotions, they are open to a wide range of emotional experiences and view themselves and others in an open, flexible, and adaptive way. In contrast to the healthy and secure attachment described above, an insecure attachment describes environments where a child's emotional needs are not adequately met by a primary caregiver. This situation is more likely to occur under certain circumstances, including after the death of a parent, unpredictable or inadequate parenting, frequent/late adoptive or foster home placements, or due to experiencing abuse or neglect. On some level, children with insecure attachments tend to experience the world as unsafe, unpredictable, and/or frightening. In an attempt to overcome some of these feelings, they develop various ways of coping. An Avoidant Attachment style is often observed in situations where a primary caregiver may be neglectful, unresponsive, de-emphasize emotional expression, or are emotionally unavailable. On some level, the child senses or experiences that their attachment needs will not be met. These children may cope by becoming excessively independent, self-reliant, and controlling of their environment. Since it would not have been adaptive to seek emotional comfort, they also tend to dismiss, suppress, or restrict their emotional expression. Where these early relationships act as "blueprints" for what we might expect from future relationships, these children often go on to form a "Dismissing Attachment" style in adulthood, characterized by an over-reliance on independence, a high need for control, an unwillingness or inability to be emotionally vulnerable in relationships, and a "dismissing" attitude with regard to the potential impact of past attachment relationships and/or the importance or emotional significance of current attachment relationships. Attachment relationships are not only restricted to childhood. As children, our attachment is to our parents, while as adults, we experience similar attachment relationships with close friends and romantic partners. In fact, close adult relationships serve many of the same functions as they did in childhood. For example, if we become upset or distressed, we might be more likely than in childhood to cope with this distress on our own, but we often still rely on close others for support and comfort. If we trust in others and are capable of being emotionally vulnerable, we will seek out these relationships when in need. The very same responses including a familiar tone of voice, eye contact, physical touch, and so on, help us to regulate our emotional distress. In secure adult attachment relationships, we value our partners or close friends, yet feel secure enough in these relationships to also support one another as individuals. Due to the importance of attachment theory in thinking about relationships, I will often explore these themes within individual and couple's therapy, when partners might be feeling insecure, less attuned, or emotionally disconnected in their relationship. This book is great for both parents and adults without children. The authors draw from both attachment theory and neuroscience to describe how these early relationships help shape who we are today. The reader will likely gain a greater insight, understanding, and appreciation for the emotional reflexes they may have learned during their own childhood. Through careful self-reflection and making peace with the past, one can avoid having to repeat maladaptive patterns of family interaction with one's own children. A highly recommended book. This book takes some of the recent trends in the psychological literature and research involving attachment, emotion regulation, and neuroscience, and puts it together in an easily digestible package for parents looking to raise a healthy child. From a developmental perspective, parents will learn how they can foster healthy socio-emotional development through the relationship they have with their child. Parents will also learn how to troubleshoot emotional impasses or difficulties they might have in connecting with their child so they can nurture a well-adjusted child with a healthy state of mind and positive sense of self. Cassidy, J. & Shaver, P. (2008). Handbook of Attachment, 2nd ed. New York: Guilford Press.